I could write for days about how Tommy Wiseau and his friend and frequent collaborator Greg Sestero have taken the world by storm by making what is nowadays considered to be the Greatest Bad Movie Of All Time© The Room, as it’s not only an incredibly entertaining movie to watch but also a fascinating film to experience, especially with a giant crowd of people – and I recommend you do so at regular screenings of the film at the Prince Charles Cinema in London, because regardless of whether you love or hate it they are so much fun to be a part of – who are just as devoted to the film as Wiseau and Sestero are. 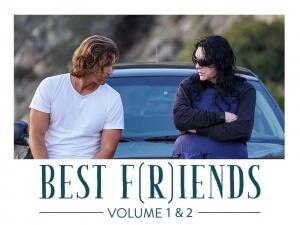 For years, an on-screen reteaming of the two seemed like a fantasy, but lo and behold both Wiseau and Sestero are back at it again with the two-part movie extravaganza Best F(r)iends, both of which will be covered in this one review because it really is just one big film that’s been split in two à la Kill Bill, and much like Tarantino’s own double-bill of carnage and mayhem this is a pair of movies that you simply need to see to believe. Wiseau only co-stars in the movie this time (I know, I’m also disappointed he’s not the director or writer on this), with writing and directing credits going to Sestero and Justin MacGregor respectively. Volume 1 opens with Sestero as Jon, a homeless drifter with a bloodied shirt and a checkered past, who stumbles his way into the path of Wiseau’s Harvey, an eccentric mortician who takes Jon on as an assistant when he takes pity on him. Soon, both Jon and Harvey go into business together by selling off the countless gold fillings that Harvey has collected over the years, earning them thousands of dollars that Harvey keeps in a safe disguised as an ATM machine – but Jon soon suspects that Harvey is trying to swindle him out of his share thanks to his increasingly bizarre behaviour (or at least, more bizarre than normal), which soon leads to a confrontation between the two that immediately goes right into Volume 2. As for what happens in the second part, I believe that should really be left unsaid because there is some mesmerizingly insane stuff that occurs throughout that film as well as this one, and the best way to describe it without going into too much detail is if The Room were instead directed by David Lynch. Yes, folks; things get that much crazier and more surreal, possibly even more so than The Room which as we all know contained some truly out-there moments that have become synonymous with bad-movie history. Best F(r)iends, however, has genuine qualities to it that Wiseau’s movie, as amazing as it is, couldn’t even begin to come close to; for instance, it benefits from some great cinematography, provided by both MacGregor and Farhan Umedaly who together capture some great shots of the alluring West Coast environment it takes place in, accomplished by some intriguing drone camera work that provide the film with some fascinating aerial shots which add to the film’s other-worldly nature. Sestero, an accomplished writer thanks to his best-selling book The Disaster Artist which was adapted into the Oscar-nominated movie from last year, has a firm grasp on dialogue and character, sometimes overly so in certain scenes where people do tend to drone on and on quite a bit, but it’s not insufferable like some of the far worse screenplays out there can be. As a director, MacGregor anchors the ship just fine, bringing out some memorable performances even outside the main duo; Rick Edwards is a stand-out as an acquaintance of one of the characters who shows up in a significant role in Volume 2, while Kristen StephensonPino shows promise as the love interest of Sestero’s character, who comes into play in a major way throughout both movies. As for the main attraction(s), it was always a given that both Wiseau and Sestero were easily going to be the greatest part of the whole thing, and both of them deliver in such amusing ways that it’s hard to resist. A passion project of Sestero’s, inspired by a road trip that the two went on after The Room’s debut, he really throws himself into the insanity of the story, as the straight man trapped in a Wonderland-style world of nonsense and ill logic, and in doing so delivers his strongest on-screen performance to date in his career. He is the man who deserves the lion’s share of the credit for these two films, for as much as The Room was Tommy Wiseau’s baby, Best F(r)iends is Sestero’s, and he nurtures it into something that pays respect to the audiences that embraced the film he is best known for, but also speaks with its own voice in a way that’s refreshing and also heartwarming. And then, you have Wiseau himself; the screening I was at for these films (shown back-to-back in one showing) may have been filled with laughter at Wiseau’s now-trademark on-screen oddness, from the way he delivers his lines to the very things he is given to do and say, but underneath the madness of it all – and it is certainly a performance and character that is, indeed, mad – is a person who merely wants to do good things for people he feels deserve it the most, even when he’s putting his own integrity in harm’s way. That kind of makes Harvey the perfect character for someone like Wiseau to play, because while he is very much playing himself in the role (to our endless entertainment), there is a self-awareness that stems from fifteen years of delighting audiences with his own film, and he seems to embrace his own eccentricity while managing to make it somewhat endearing and without diving into self-parody. As odd as the movie is – and again, I want to reiterate that Best F(r)iends is a truly odd experience in the best possible way – at its centre is a sweet and loving tribute to two people who over the years have depended on each other for personal re-assurance and unconditional companionship, as documented in Sestero’s book which was later dramatized in James Franco’s outstanding adaptation, but throughout all of it have stayed loyal to each other and been there when one or the other was riddled with self-doubt. While we all laugh with and at the strangeness of The Room, it’s easy to forget that it came from a man’s undying passion for making a movie that he felt to be his view of the world around him; Best F(r)iends goes right along with it as a passion project of a different kind, one that pays tribute to a very strange man and his loyal and admiring best friend. Best F(r)iends Volumes 1 and 2 are a pair of movies that need to be seen to be believed, outdoing even Tommy Wiseau’s masterpiece The Room in terms of sheer insanity, but retaining at its centre a sweet tribute to a long-lasting friendship that’s been the core to that infamous movie’s resounding – and unintentional – success. If you love The Room, you can’t afford to miss them.